Pharos by Guy Haley was one of the Horus Heresy novels I was most looking forward to reading since its release. Part of this is due to an awesome cover, but I'm also a fan of Alexis Pollux, the mystery of Sotha, and the Imperium Secondus timeline in general. Luckily it doesn't disappoint. Again, let me reiterate how awesome this cover is. There's so much going on and Pollus just looks awesome. This, Angels of Caliban and Praetorian of Dorn are probably my three favorite covers so far. The inclusion of those very distinctive trees on the cover gives me a real sense of what Sotha looks like too, almost renaissance like. Once you get past the awesome cover we have a story that deals with the fallout from several other books. Having just finished Deathfire this was a little bit of a hard left for me, and not because of the story content really, but how it was structured. Deathfire told a very tight, concise story, that only ever focused on a set number of characters who were all on the same journey together. Pharos is kind of the opposite of that in that I would be hard pressed to tell you who the "main character" was. It's a larger cast of characters, most of them in different places, and only interacting with their own small group of characters for the most part. This isn't a bad thing at all, I just found it very different from the Horus Heresy story I had just finished, which really just points out the variety of stories you can find within one story. The story starts out with an Ultramarine picket ship around the outskirts of the Sothan system on patrol. Sotha is the home of the beacon known as the Pharos. This little understood alien device is the glue that's holding the Imperium Secondus together and allowing Guilliman to govern his empire. With the Ruinstorm of Chaos cutting off most of the galaxy from each other and smother the Astronomicon it is the only way for Imperial ships to transverse long distances, acting as a sort of lighthouse in the Warp and also providing a rather cool mode of transport we'll see later on. It also allows for communication between the worlds since the Ruinstorm makes it too dangerous and unreliable for astropaths. Suffice to say, it's very important and must be guarded and kept secret from Horus' forces at all costs. When this picket ship comes across a derelict Night Lords ship floating through their territory it understandably becomes a cause for alarm. Without giving too much away, because this part is rather cool, the Night Lords end up taking over the Ultramarine ship and use it to launch a stealth attack on the orbital defense platform above Sotha, which precedes a full scale invasion by the Night Lords. All of these scene are really cool, and written very well, but it's hard for me to talk about them without kind of ruining the book. A big part of the Night Lords is how they trick people and launch surprise attacks, so I definitely want you going into the book not knowing what's going to happen. Once the attack on Sotha is fully under way, Dantioch, an Iron Warrior who stayed loyal to the Emperor, and Pollux of the Imperial Fists, are quick to try and reach out to the rest of Imperium Secondus. Roboute Guilliman decides to set out for Sotha himself at the head of a retribution fleet, but it's going to take him a long time without the help of the Pharos. The beacon will instead be focused on a much smaller, but closer Ultramarine force so they can get there and help out Sotha until Guilliman arrives. Until then the forces of Sotha are on their own and heavily outnumbered. It becomes a guerilla war of sorts, with the loyalist forces using the terrain to their advantage. The Pharos is located inside of a massive mountain, and is actually kind of the mountain itself. The whole thing is riddled with strange alien tunnels, which allows the loyalists to frustrate the Night Lord forces. Like I said at the start, this is more a bunch of smaller isolated stories with some connection to each other as everyone fights their own battle. We get the story of Dantioch and Pollux which is kind of the higher level story since they are directing all of the fighting. They also interact with the beacon and Guilliman the most. I really like Dantioch so I'm glad he got plenty of time to shine in this book. Pollux, I feel, got a little less of the spot light, but at the end I really like what is done with him. For the first time I can remember we also get the story of a unit of Scouts during the Heresy. They are on the orbital at the start of the book and must fight their way down to the surface to help reinforce the mountain. There story was particularly interesting since we get to see a Marine fight who isn't fully developed yet and what that means. On the human side of things is a member of the Imperial Army stationed on the planet named Mericus. He's your typical smart alecky guardsmen type character but lets use see the more human side of the conflict. This is a planet with a population of real people and not just a military base. We also get some meaty scenes with Guilliman and Sanguinius, which are always welcome. Primarch scenes are often some of the best, and a surprise appearance from a third Primarch is one of the highlights of the book. The Night Lords also have their own major characters, with the standouts being a pair of actual brothers. They represent the dichotomy of the legion, with one of them having fully succumbed to all of the worst tendencies of the Night Lords. The other one still understands that their methods are a means to an end and not the end goal itself. I like how Guy used these brothers to play out the battle going on within the legion as a whole as it tries to figure out what identity it really has. We all know how it turns out 10,000 years later, but it's still cool to see the struggle for their soul. The story is really fast paced with a good balance of action scenes and more reserved dialogue scenes. While a great book on its own, Pharos works best at collecting several loose story threads and tying them up before creating some more of its own. We get to see what happens with Dantioch and Pollux, the tensions between Guilliman and Sanguinius, what happened to a large chunk of the Night Lords legion after the Dark Angels broke them and the internal struggle going on within their ranks, the Pharos itself, and more. 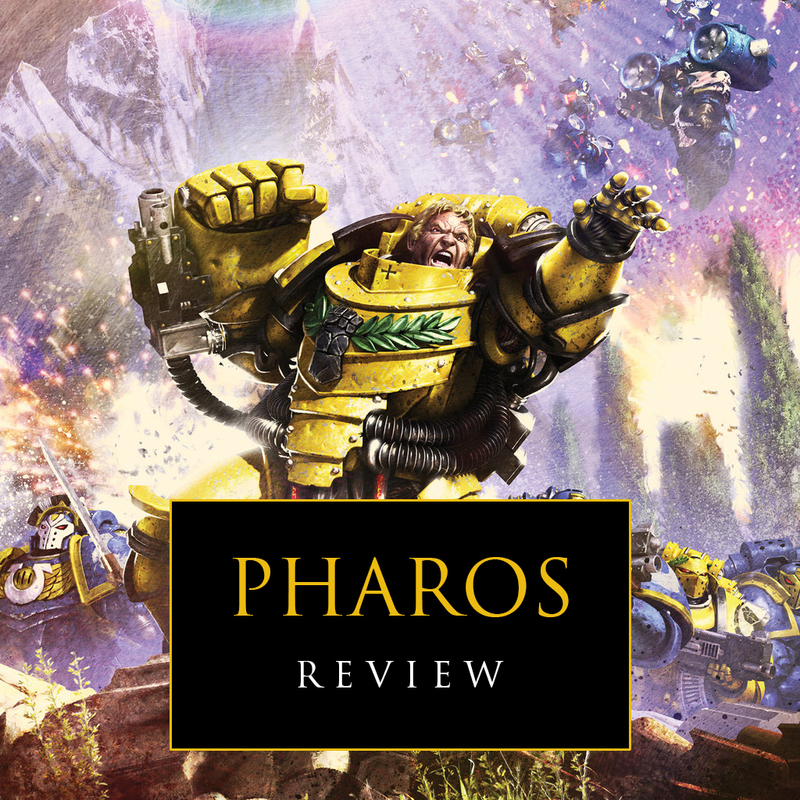 It also does a great job at showing some new stuff we haven't seen yet like the Pharos' powers and Scouts during the Heresy. I really enjoyed this book and am excited to see where it goes. It does a good job at setting up what I presume will be the end of the Imperium Secondus storyline. If you're a fan of the Ultramarines, Pollux and Dantioch, or the Night Lords then this is a good book for you. You definitely have to read several other novels before this or you'll be a bit confused. I would recommend all of the Night Lords short stories, Dantioch's short story, Crimson Fist, Fear to Tread, and Unremembered Empire at the very least. This is very much a part of the larger ongoing narrative and does a good job of keeping that momentum moving. I look forward to reading more from Guy Haley in the Heresy series and seeing how this all wraps up in Ultramar.